You can add features such as attribute keywords and classifiers directly to an element, using the Element Keywords and Classifiers menu. 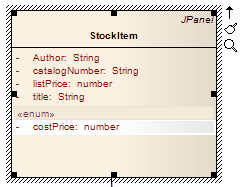 This enables you to rapidly assign details element item by element item, directly from a diagram. Click on the element, and on the attribute to edit within the element. Select the 'Edit Selected' menu option (or press F2) to enable you to edit the attribute directly from the diagram. The name of the attribute is highlighted. Right-click on the attribute name to display the context menu. If the data type is a raw data type, Enterprise Architect displays the message: The data type is a raw data type.